At 36 , the centre-back, a late replacement for the ill Michael Keane became the oldest player to score in the Premier League this season. Everton captain Phil Jagielka a late inclusion to the toffees line up became the hero of the match as he scored his first goal in almost two years putting a doubt in the minds of the Arsenal supporters regarding top four finish . At 36 , the centre-back, a late replacement for the ill Michael Keane became the oldest player to score in the Premier League this season with his early close-range finish at Goodison Park. Marco Silva’s side have now recorded two wins against top four teams in as many home games, while a first league defeat in two months for Arsenal leaves their fourth-place vulnerable to Chelsea – level on points – who play West Ham on Monday. Unai Emery’s side managed just two shots on target and have also gone 16 consecutive top-flight away match without a clean sheet – for the first time since February 1985. One goal should not have been enough to beat a team with this much talent but it was as Jagielka’s fourth appearance of the season – and his first at Goodison Park in 11 months proved to be a blessing in disguise. Dominic Calvert-Lewin’s header from Lucas Digne’s 10th-minute long throw was half-blocked but the ball dropped through the crowd to Jagielka who prodded home Everton’s 800th Premier League home goal from three yards. 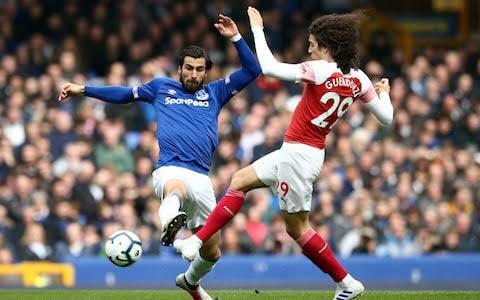 The goal – and the home win over Chelsea last time out – gave Everton the confidence to take the game by the scruff of the neck. They were helped, however, by their opponents’ inability to gain a foothold in midfield with Andre Gomes spraying passes at will and Idrissa Gana Gueye covering the hard yards. Up front Calvert-Lewin’s incessant running has proved a handful for many centre-backs this season and his boundless energy was no different for Sokratis Papastathopoulos and Shkodran Mustafi, both of whom struggled with his pace and aerial capability. Goalkeeper Jordan Pickford – who was disciplined in the week for his involvement in a bar fracas in the early hours of Monday – was put under little pressure but was keeping things simple none-the-less and his range kicking frequently picked out Calvert-Lewin or an advanced Digne. Emery had to change things and he did so at half-time as he swapped Mohamed Elneny and Sead Kolasinac for Pierre-Emerick Aubameyang and Aaron Ramsey in switching to a flat back four and two up front. Pickford, a virtual spectator in the first half, failed his first challenge after the break when he came to punch Ramsey’s header but weakly returned the ball to the midfielder who wastefully volleyed over. Ramsey had an effect in swinging the midfield balance back towards Arsenal but with wingers Bernard and Richarlison diligently tracking back, the spaces were just not there. And with Calvert-Lewin continuing to win everything in the air, Arsenal were far from comfortable at the back, although Gylfi Sigurdsson, Richarlison and Bernard could all have put the match to bed in the final 20 minutes. That they were allowed to get away with their misses showed just how toothless the Gunners were with Pickford not having to make a save in back-to-back home league victories for only the second time since October, put Everton back in the race for seventh place.